While it’ll be interesting to watch how the campaign develops and the tactics they use, especially with so many countries involved, as a campaigner I’ve also been interested in following the way that Oxfam GB have already soft launched the campaign to key activists around the country. 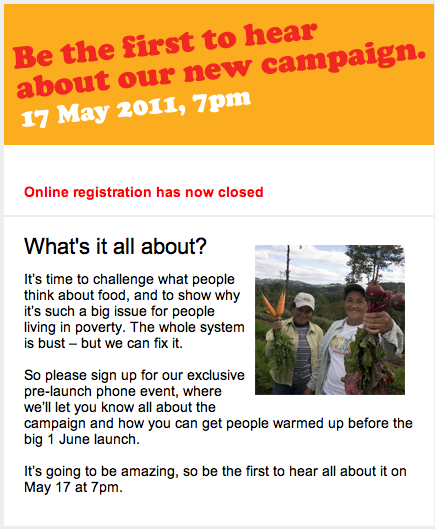 For example a colleague forwarded me an invite to a supporter phone briefing the activism team hosted on May 17th. It’s the first time I’ve come across the idea of such a call, but it seems like a really inspired and practical idea. The call involved speakers from the Oxfam GB’s Campaigns and Policy team, alongside representatives from the Events team with practical suggestions about what people could do. It builds a sense of ownership – For those invited to be part of the call to allows them to feel that they’re the first to know, that they’ve got a responsibility to promote the campaigns to their own networks when it goes live. It equips people and provides a space to ask the difficult questions – It’s easy to launch a new campaign with the accompanying policy report, but the reality is that most activists don’t have time to sit down immediately to read and digest it. A call like this allows the opportunity for supporters to feel like they’ve had the opportunity to ask before they’re hearing about it on the news. It builds loyalty – by breaking down the divide between staff and supporters, especially by actively asking for suggestions and ideas, it makes Team Oxfam bigger. They also actively encouraged those on the call to join a group on their ‘enabler‘ site to keep the conversation going. PowWowNow is a free conference call service, which can facilitate ‘event calls’ for up to 300 people. Cover It Live is an excellent interface for facilitating live discussion between a group. It’s free and you can use it to display images, carry out polls and can even include live video from a webcam if you’re prepared to pay a little extra. What other free technology exists that could enhance a call like this? Have you seen other organisations use similar tools to keep key supporters informed? RESULTS are based on this big phone call model – or at any rate they used to be, and I think they still are. It works well for them. I used to work in Canada, and had volunteers across Canada and the USA. With that size of territory (think 5 time zones) online organizing was a pretty important tool. I’ve used webinar services (GoToMeeting, WebEx) to hold interactive online sessions with volunteers. With CUSO-VSO (the North American organization that’s part of VSO) we tried holding recruitment information events online, which were moderately successful. (Higher time cost per attendee than an urban in-person meeting, but how else do you reach people in Alaska?) Having a call-in-only option was important. Skype also works well, for much smaller groups and more collaborative (less presentation-focused) events. Thanks for the comment….good to hear how its worked for others. Will look into GoToMeeting as another option.